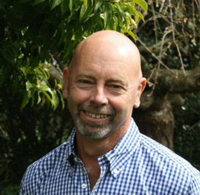 Wairere Nursery recommends Anthony Skinner from Garden Graphix for all landscaping requirements. Anthony’s love of plants and talent for design is partly inherited. His grandparents were dedicated gardeners and plant enthusiasts and his paternal grandmother was well renowned as a painter, weaver, floral artist and gardener. She took immense pride in the fact that she passed University Entrance Art at the age of 75 years. During his schooling, Anthony excelled at Technical Drawing, Art and Architecture and completed his University Entrance year in Art and Art History with substantial achievements. Anthony is an artist of considerable distinction. One of his paintings was presented to the Honorable Rob Muldoon when he was Prime Minister of New Zealand. As a natural consequence of Anthony's exceptional talent in painting landscapes, which requires a fine eye for detail and a heightened sense of balance, proportion and structure, Anthony branched out into landscaping. To his credit, Anthony is self taught in the art of drawing plans through which to bring his exceptional designs to focus. His excellence in the field of landscape design has been recognized by the many prestigious awards presented to him in recent years, from both International and National Judges, along with ''most popular designer'' votes from the public in general. On purchasing a villa to showcase his wonderful antique collections, which include Georgian glass and porcelain, Anthony’s talents once again extended to Interior Design. His ability to work with other media is also reflected in his lighting designs, which still take pride of place in many up-market Hotels and Restaurants in New Zealand and Australia. Anthony’s work in Landscape Design currently occupies most of his time but he still finds time to paint. He continues to work on paintings of rural landscapes, old buildings and other scenes of interest in watercolour, oil and charcoal.